Sign up here to receive text alerts from The Cleveland Whitecaps for weather cancellations or other important information. Please use the links below if you are registering for Caps FC for the first time. High School players please register for the 2018-19 Soccer Season not later than October 1, 2018. 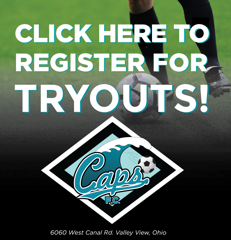 All Current U14 and younger CAPS FC members and trapped U15 players should register for the 2018-19 Season not later than July 1st.